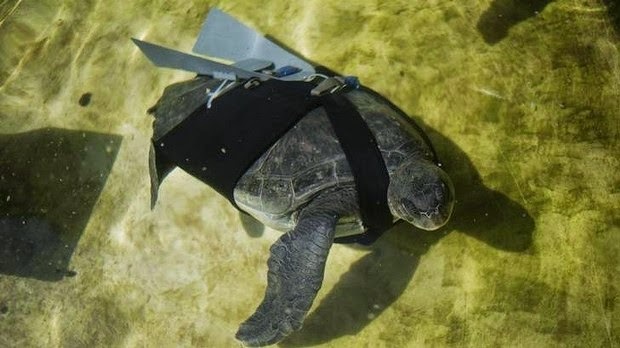 A badly injured sea turtle's prospects are looking up, thanks to a new prosthetic fin designed by an Israeli team and modelled on the wings of a US fighter jet. The green sea turtle, named "Hofesh", the Hebrew word for "freedom", was caught in a fishing net off Israel's Mediterranean coast in early 2009. With his two left flippers badly injured, rescuers had to amputate, leaving him with a pair of stumps that made it difficult to swim. Then, inspired by the design of Lockheed Martin's F-22 Raptor warplane, Gez designed a new prosthetic with two fins. The device, somewhat resembling the aircraft's wings, was strapped on to Hofesh's back on Thursday, allowing him to move easily around his tank. But he shares a tank with a blind female turtle named Tsurit, and researchers are optimistic the pair will mate, potentially adding to the local population of the endangered green sea turtles. He said it was difficult to say exactly how old the two turtles are, but they are estimated to be between 20 and 25, and approaching the age of sexual maturity.